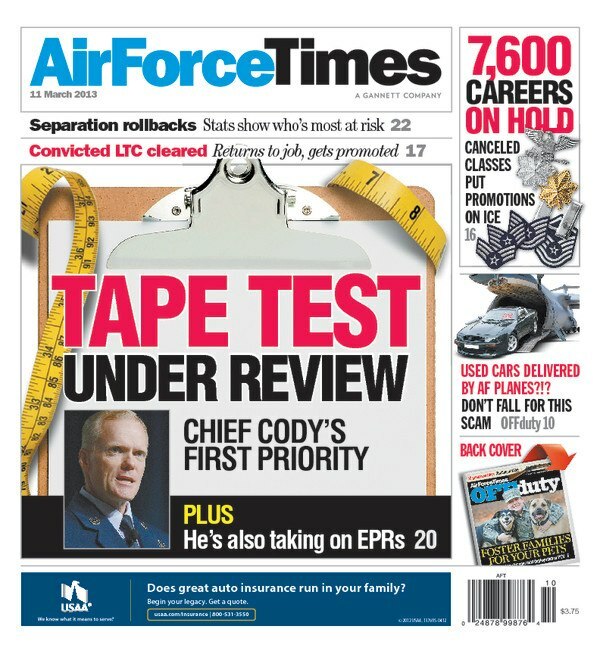 Chief Master Sergeant of the Air Force James Cody isn’t wasting any time delving into two of the most heated issues for enlisted airmen: Waist measurements and EPRs. Read how Cody will examine both issues over the next six months to see if there are solutions to the frustrations facing airmen. After that, he’s moving on to other issues, like computer based training. This week’s edition also has a chart showing which airmen are most at risk for date of separation rollbacks this fiscal year. You can see how many airmen the Air Force wants to select by rank and Air Force Specialty Code. But the pain doesn’t stop there: Read how the massive cuts to defense spending known as “sequestration” may result in even further cuts to end strength next fiscal year. In other news, the Air Force is putting space and missile officers into two separate career fields to give junior officers experience with space systems earlier in their careers. Our story explains which airmen are affected. And details have emerged that may explain why the conviction of a former inspector general at Aviano Air Base, Italy, was thrown out recently. Check out our story on what a friend of the woman who accused him of sexual assault wrote the convening authority.